Discovered while researching my next book: Central to Allied victories in WWII, including the Battle of Midway and the sinking of the Japanese submarine I-52, was the success of cryptanalysts in the breaking of German and Japanese codes. One of the keys to the decoding process was having some idea of phrases that might be in the messages to be decoded. These “cribs” vastly reduced the effort required. But how to get cribs, i.e., already decoded messages (or fragments)? One scheme, proposed by a British naval commander, involved purposely ditching a captured German bomber in the English Channel, crewed by German-speaking, Luftwaffe-uniformed men, who would capture the expected German rescue boat (and its code settings and documents). Known as “Operation Ruthless,” the mission was approved, and a crew was recruited and trained, but was never carried out. The commander who proposed the daring undertaking (and volunteered to be the pilot) was none other than Ian Fleming, author of the James Bond series. These and other adventures as a wartime intelligence officer provided great inspiration for his popular novels. It is thought that Fleming’s boss, Admiral Hugh “Quex” Sinclair (known as “C” in official correspondence) was the model for James Bond’s boss “M” in the stories. 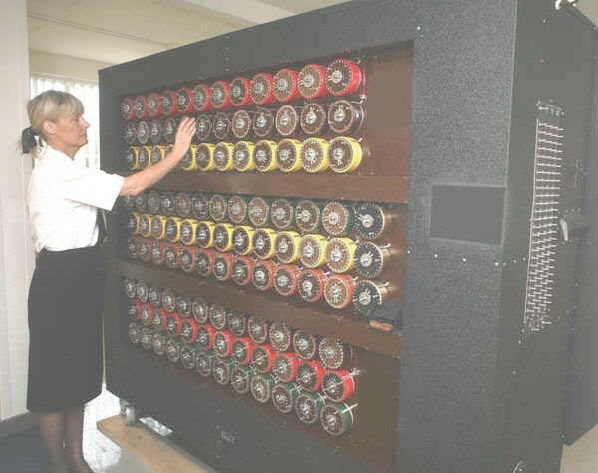 Rebuilt British decoding “Bombe” at Bletchley Park, designed by Alan Turing and others as featured in the recent movie Imitation Game.